This editor, prior to the 2405FPW, had actually never ordered a Dell product before. I am unhappy to report that the buying experience was decidedly unpleasant from the get-go. First and foremost, Dell does not list any warranty information of any kind on the 2405FPW product page. Even more frustrating, after calling Dell and inquiring, the sales rep was unable to find the information and asked me to be put on hold. After a number of minutes, I was told that I it would take a few minutes longer and that I would be called back “in, like, a few minutes.” After about 3 hours, I had still received no word from Dell. I tried calling again, and the second employee also, had no idea. Frustrated, I gave up and ordered the monitor through the website. Once I received the monitor, there was no warranty information included of any kind. Talk about confusing. The HP L2335, by comparison, comes with a manufacturer warranty of 3 years standard. Retail businesses, particularly in the areas of clothing and cosmetics, refer to the notion of “emotional experience.” Emotional experience refers to the emotional value a shopper receives from visiting the store, looking at the displays and atmosphere, receiving help, and finally the presentation of the products themselves. I would rate my emotional experience with Dell Sales as a C+. 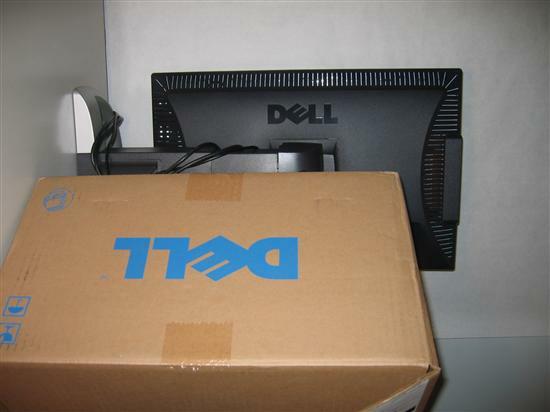 The 2405FPW comes packed in the signature brown Dell box with blue logo. A plastic guard comes taped over the panel for protection, and the somewhat bulky, yet sturdy, stand is separate from the panel in the box.